A month ago, I posted an article about Hillary Clinton being the United States’ first Phantom President: http://thunderwingmatrix.tumblr.com/post/154834720947/hillary-clinton-our-phantom-president-2016-has As part of the article, I posted two mock-up Newsweek victory covers for Gary Johnson and Jill Stein. The existence of the Hillary Clinton victory magazine made me think of what the world would be like if she, or a different candidate won, so I decided to do some more mock-ups of alternate 2016 election winners. 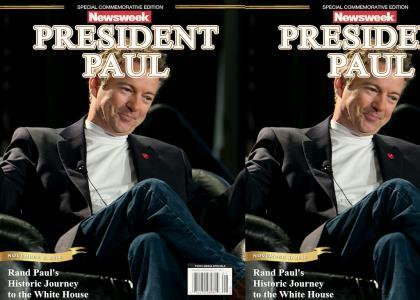 This is the third of several mock-ups I created of possible alternate 2016 US Presidential election winners, Republican Rand Paul. Enjoy! I wanna see you make some new music channel sites while you're at it! Superdreamkilla would love to see you posting sites again!!!!!!!!!!!!!!!!! !